There are a lot of reasons why I love holidays, like buying a new dress (love this Gap Floral Sateen dress!). But most importantly, I love spending time with my family. As I have gotten older, family time is few + far between, so coming home for a holiday means more to me now, then it did when I was younger. Easter morning, before heading off to Easter service, Dad always makes pancakes. I soak those babies in warm maple syrup + butter (yum!). This year, I have decided that I a might indulge in a mimosa (or two!) with my mom while making + decorating homemade Easter cookies. Whatever this Easter Sunday entails, at least I will be spending it with my family. What are your plans for Easter Sunday? Any fun family traditions you want to share? What I love most about April are sunshine rainstorms. I love the feeling I get when sunshine is pouring through the clouds & the smell of rain on the wet grass. I especially love when it happens on the weekends & I get to take a mid-afternoon nap with the windows open. This Spring time casual look is perfect for a rainy weekend. Throw on a cute shirt dress, cozy pair of sandals, a head band & you can't forget the stylish umbrella! Lipstick, Bows & Tutu's! OH MY! I have come to the conclusion that I have an infatuation with lipstick, bows & tutu's (& Sincerely Jules #celfie tee + sweatshirt) & honestly, I am a-okay with it, because I think a lot of people do to! (am I wrong?). // I recently purchased the #celfie tee & I absolutely LAHVE it. It is super cozy & I feel like it is okay to take #celfie pics in it & not feel weird. So the #celfie sweatshirt would be just as perfect. // I def. know I'm not the only one in love with the Starbucks + Alice & Olivia ceramic mug. & I am sure that it had me hooked when I saw the tutu or the stripes orrrr the black + gold, but that's besides the point because I already ordered mine off line & can't wait to get this cute little thing in the mail. // Bows, bows + more bows. I think that if I had this pretty little USB designed by the oh-so-talented Kate Spade, just like Miss. Aubrey said, I would be "transferring files alllll day." 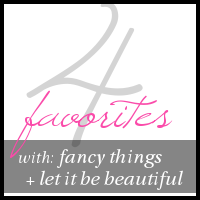 The Four Favorites link-up is held on Wednesdays and there aren't any rules, but we would really appreciate it if you followed both Kristin + I as well as our co-host Chelsea of Chelsea and The City, as well as shared the button on your Four Favorites post!